33 lbs. 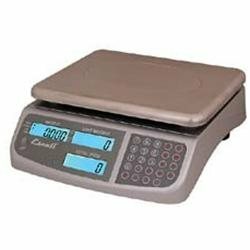 C-Series Counting Sca..
ESA1065: Features: -Escali C3315 C-Series digital counting scales a programmable user friendly, high quality counting scale that is a great scale for various inventory and quality control applications. -Capacity is 33 lbs. -Accurately measures in grams, kilograms or poundss. -Has 3 backlight displays: total weight, individual weight and quantitys. -Stainless steel plate is removable for ease clean ups. -Equipped with a rechargeable battery makes this the ultimate portable counting scale. 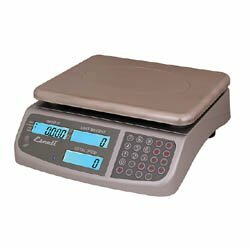 Escali C3315 C Series digital counting scales a programmable user friendly, high quality counting scale that is a great scale for various inventory and quality control applications. Capacity is 33 lbs. Accurately measures in grams, kilograms or poundss. Has 3 backlight displays: total weight, individual weight and quantitys. Stainless steel plate is removable for ease clean ups. Equipped with a rechargeable battery makes this the ultimate portable counting scale. 1 Year Warranty. Material: ABS Plastic. Dimensions: 3.25' H x 12' W x 10.25' D.